Based on the prompt above. The featured genre should be prominent, but need not be the primary or only genre used. 2000 words or less. A word count must be included in the body of your item (top or bottom, not in the intro/header). 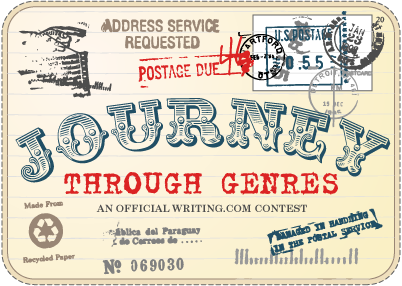 $100.00 in Writing.Com Gift Points and an exclusive Journey Through Genres Merit Badge, both virtual and physical! $50.00 in Writing.Com Gift Points and an exclusive Journey Through Genres Merit Badge, both virtual and physical! $25.00 in Writing.Com Gift Points and an exclusive Journey Through Genres Merit Badge, both virtual and physical! Generated in 1.86 seconds at 12:12am on Apr 24, 2019 via server WWW2.